In the classic case of a child paying back to its parent, WordPress is actually helping PHP grow. A platform developed by the open source scripting language (PHP), how did WordPress ended up contributing more towards it? If the present trends are anything to go by, a lot of developers register a date with PHP because they want to customize WordPress. Although the ones belonging to the purist school of thoughts would still opt for PHP development. 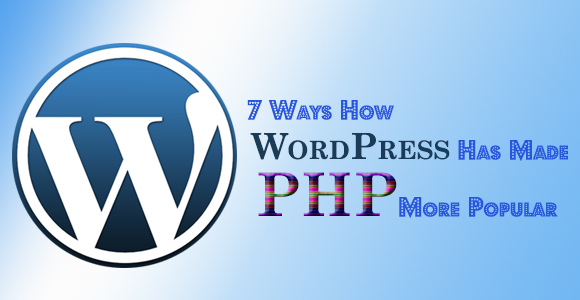 Here is a roundup of our top 7 reasons of how wordpress is actually making PHP more popular..
# WordPress is the most popular PHP framework! Not many of us knew WordPress was actually a framework by PHP, did we? Well yes, we are not counting the WordPress or PHP Nazis in this. The rest of us only believed WordPress to be a customized CMS for managing blogs and sites, which is merely powered by PHP. Anyway, WordPress is actually a PHP framework and as it so happens, it is also the most popular amongst all of them. In fact, what’s striking is the fact that it is more popular than most of the other PHP frameworks such as Symfony, CakePHP, and Zend etc put together. # And while we are talking about popularity WordPress beats other PHP applications too! Although the search engine rankings may paint a different picture at certain times, WordPress still is the most popular PHP application to be ever used. Search engines change their algorithms every so often, but a more reliable measure would be to go by Google Trends, as they are much more stable and are not subjected to obscure algorithms. And the trends show that WordPress is a much more application platform, as against Drupal, Joomla and Zend based Magento. Another component adding to the popularity of an otherwise ubiquitously popular WordPress system is the widespread scalability that it provides, owing to the plugin architecture. With the help of the wide gamut of plugins already available, any user can anytime increase the scope and utility of their website, with the required plugin. Besides, it is much more easy and self explanatory to download and install WordPress plugins, as against various other PHP applications. And you were wondering why WordPress is more popular! Although WordPress does allow certain third party components, they are not full stack. This is simply because WordPress does not need a full stack framework. Developing a website or a blog with WordPress even in the absence of a third party framework will have no substantial effect on the same, owing to the superior platform that WordPress is. Let us take you to the world of Magento development. Now, Magento has basically powered by Zend framework, but happens to be much more popular than the same. The point that we are pressing on is that the development technology or the components if of little utility for the end term users, as against the applications based on such technologies and components, which actually works towards solving user problems. WordPress can be used to cater to a number of purposes; it works as an enhanced blogging platform, allows easy SEO, makes it very simple for the owners to administer blogs and websites both under one environment etc. No wonder it is more popular than PHP. Various novice developers have grown an affinity towards PHP development owing to WordPress. Mostly they start up owning a WP Blog and then as and when the need arises, they learn PHP programming via various tutorials available online. Most of the PHP developers started because they needed to add one feature or the other in their project. Do we need to state the obvious? WordPress actually helped grow the community of PHP developers. In the end, there is no competition. Both of these technologies were developed to promote easy web development, and neither one can exist without the other. Somehow, PHP still walks away with the tag of being pure and WordPress more pragmatic. People often start with WordPress and later migrate towards much more profound PHP development. If you would rather own a website, optimize it for various search engines and take it from there, WordPress is your solution, but if you require a custom website, with tailor made features, functionalities and specification, PHP Development Services is the way for you to go. About Author : Celin is a PHP Developer and also a expert technical writer, she is working with leading Company having expertise in WordPress and PHP Development Services.